The classic French way of starting a base for a puréed soup involves cutting a mirepoix of onions, leeks, carrots and celery to form a base to which the main ingredient is added. This can be cut to any size and is generally determined by the method of cooking you are going to use. 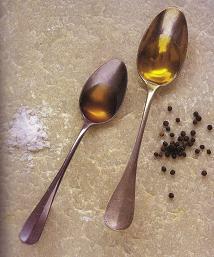 For quick sauces you should cut a fine dice, but for stews and stocks you cut them to large chunks. Besides having an intense dislike of the celery family, I don't feel the "classic" way is at all necessary these days and nor is it appropriate to the modern style of the soup. I normally use a base of thinly sliced white onion, sliced garlic and plenty of black pepper, which I sweat in a little butter. As the main ingredient for the soup is squash, you need to use something to maintain the colour and I like to add a little thinly sliced carrot. When "blitzing" or puréeing anything in a food processor, you are incorporating air into the product, which detracts from the colour. 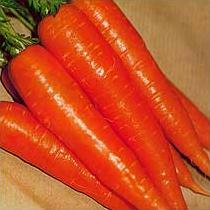 This is exactly why carrot is part of a regular mirepoix - to maintain the rich, vibrant colour of the soup. Of course if you were making a pale coloured soup such as potato or celeriac you would leave the carrot out so as not to ruin the desired light tone. 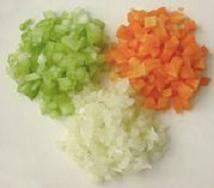 This is appropriately called a white mirepoix. When the onions are translucent and the carrot is softened, I add the squash. I then follow with vegetable stock, which I always estimate. I usually use just enough that the vegetables can flow about freely. I can't tell you an exact amount to use because it depends on the depth of your pan and how long you cook it out for. I try to cook mine for as little time as possible, to maintain as much of the nutrients of the veg as possible. I also pop in a bouquet garni, which consists of a bay leaf, a few sprigs of thyme and a few peppercorns wrapped in a leek leaf and tied with string. 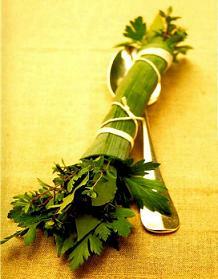 Parsley stalks are also often used, but I don't use them in mine. If you don't have these ingredients to hand, or you just don't have the time, bouquet garnis are widely available in supermarkets. A good hint is to leave enough excess string on the end of the bouquet garni that you can tie it to the hole in the pan handle. Once cooked, I blend the mixture in a food processor in two goes, as my blender is quite small. Now I return the soup to a clean pan and correct the consistency and seasoning by tasting, using trial and error until perfect. At this point, I also add a little squeezed lemon juice and zest from half a lemon. I find the acidity really brings out the natural flavour of the squash without overpowering it. This is the only time I add salt to the dish, as I personally have a relatively low tolerance to it. I see everyone as being either a salt person or a pepper person - a bit like being a gold person or a silver person it's what suits your taste. Growing up with my mum's cooking it was no contest. I soon acquired a taste for pepper and now add it to absoloutely everything. When I use salt, I prefer Maldon sea salt from Essex. Similar large crystal sea salts are available in other countries. 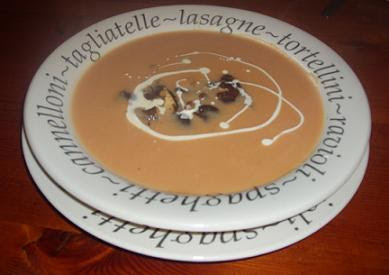 Now the soup is ready, I serve it with shiitake mushrooms, which act as croutons. I start by cleaning off any dirt with my hands, and then slice them in half lengthways. I leave them to marinate in some dark soy sauce and vegetable oil while I do the veg preparation, which gives them a wonderful flavour. When ready to serve, I remove the mushrooms from the marinade, drain off and throw straight into a hot frying pan. They will need little or no additional oil or butter to fry in as they have absorbed moisture from their marinade. I toss the mushrooms for a few minutes and then add the juice from the other half of the lemon. Be very careful at this point, as mushrooms can take on the flavour of lemon very rapidly, so you don't want to let them stew. Immediately remove from the heat and allow to rest for a second while you plate up the soup. When ready, drop a few mushrooms into each bowl of soup, add a swirl of cream if your waistline can handle it, and you're ready to go. As an alternative to shiitake mushrooms, you can try using oysters or morels. 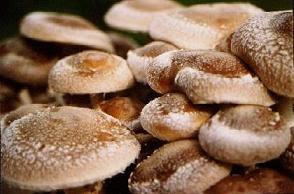 I find shiitake to have the best texture and not take up too much citrus flavour. 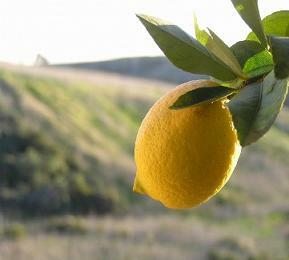 With this variety the flavour of the mushroom is enhanced by the lemon rather than being drowned by it. Lime gives a different result to lemon, but equally pleasing. P.S. I notice that photos of shiitake on the web tend to proudly show off long stalks. Don't be fooled. Shorter stalks = more fresh, as the stalks continue to grow after picking.